Click here to view in larger window, or read the text below. 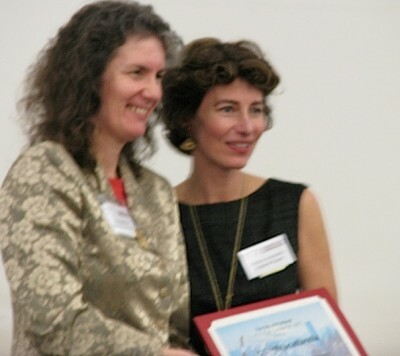 Portland, OR Oct. 23, 2011– Christy Scattarella, Founder and Executive Director of The Shadow Project, has received the City of Portland’s 2011 “Making a Difference” Award in Education. City Commissioner Amanda Fritz made the presentation October 20 at Connecting Communities, an event attended by more than 500 people celebrating the strengths and diversity of all persons with disabilities. Christy was recognized for creating and leading a program that partners with teachers to help children with special needs become confident, engaged learners and turn “I can’t” into “I can!” The Shadow Project also builds school-wide appreciation for children who learn differently. The Shadow Project vision is for all children with learning challenges to be recognized as courageous, capable and able to learn. In 2008 Christy received the Oregon Education Association’s highest statewide honor, “Education Citizen of the Year,” and was chosen as one of Nabisco’s “100 Extraordinary Women” for her work to improve educational opportunities for children with learning challenges. Christy’s work was inspired by her son, Alex and named for his dog, Shadow. Launched with just 40 students, today the program serves more than 1,300 children annually in 29 schools in Portland, Yamhill County, Hillsboro and Springfield. Alex is now a senior in college.